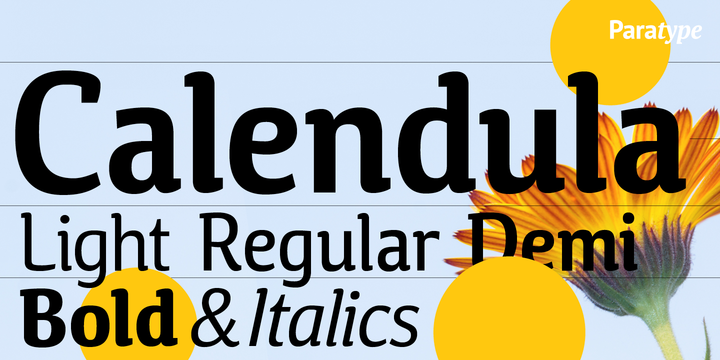 Calendula is a typeface created by Natalia Vasilieva and published by ParaType which comes in 8 styles, 4 weights with accompanying italics, stylistic set and multilingual support. With a humanistic touch, it has low contrast and one-sided serifs. It is iadeal for display, headline, magazine, poster, packaging, text but also for advertising. Have fun! Price: starting from $30,00 for one font to $150,00 for all 8 fonts. A font description published on Friday, August 11th, 2017 in Fonts, Natalia Vasilyeva, ParaType by Alexandra that has 2,078 views.